In 1731, William Hogarth (British, 1697-1764) created a new form of art, one he called “modern moral subjects.” He began telling stories of contemporary life, through a series of “scenes” that could be engraved and sold to the general public. Hogarth’s approach was not to preach virtue, but instead to satirize vice and folly. This approach was so effective that it earned him the title of “Comic History Painter” from his friend Henry Fielding. 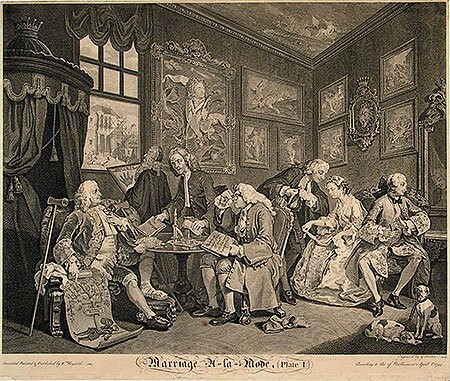 Marriage A-la-Mode or A Variety of Modern Occurences in High Life was by far Hogarth’s most popular and enduring of these “moral” series. Painted mainly in 1743 and published in 1745, it contains all the elements that make Hogarth a master satirist. Not only is the series a keenly observed and savage caricature of the aspirations and foibles of the upper classes, it also contains clever allusions to proverbs and slang of the day, as well as innumerable background details that contribute to the meaning of each scene. The story is not a pretty one. It begins with a marriage arranged by two self-seeking fathers: one, a rich Alderman of the City of London who craves social status and buys it by marrying off his helpless daughter; and the other, the Earl of Squander — a spendthrift nobleman who desperately needs cash and acquires it by marrying off his foppish and unprincipled son. There is never any question of love or even compatibility. Flush with money but no moral grounding, the married couple soon strays into foolish diversions and adultery — and then subsequently to venereal disease, murder and suicide. Hogarth hired three highly skilled French engravers working in London to produce the series: Bernard Baron (plates II and III), Gérard Jean-Baptiste Scotin (plates I and VI) and Simon-François Ravenet (plates IV and V). As these were reproductive engravings copied directly from the original works, the printings are in reverse of the paintings. The original paintings can be found today in the National Gallery of Art, London.